The Panthers Group is a network of six (6) licensed clubs providing leisure, recreation and entertainment services for our members and guests. Our clubs are registered under the Registered Clubs Act 1976 and we comply with the Privacy Act 1998, as well as the AML/CTF Act. Collection of these details is essential for processing and maintaining your membership. We may also collect data on the way you utilise and participate in services, promotions and activities within the club and when making purchases or playing gaming machines. Under the Registered Clubs Act Patrons visiting any of our clubs are required to produce suitable identification to gain entry to the premises. Suitable identification is primarily Driver’s License, Passport and Proof of Age Cards. We record your details when signing in. The Panthers group uses an electronic sign in system and in most cases will scan your identification for faster and safer processing. If you do not wish to have your identification scanned you can notify us prior to signing in. For more information regarding our sign in procedures or identification requirements please contact your local Panthers Club. We will only use your personal information for the purpose in which you have provided it or where we are required or authorised to do so by law. Primarily we will use your personal information in order to contact you regarding promotions and offers that we believe will be of particular interest to you. If you do not wish to be contacted, wish to change or cease the type of offers you are receiving or if you wish to change the method in which we contact you, you can notify us at any time and we will update your preferences. We may also use your personal information to understand and improve the way you use our Clubs services or amenities. We encourage you to always present your Membership Club when transacting a sale within our premises or using a gaming machine as this allows us to measure the success and suitability of services and offers that we provide to you. There are circumstances where the Panthers Group may need to share your personal information with an organisation that is facilitating the operation of our business by helping us to improve our services to you or hosting our communication methods. An example of this would be an email host or SMS service provider. Our service providers are required to maintain the confidentiality of any personal information we collect. We do not disclose or send personal information collected by us to any overseas parties unless required to do so by law. We rely on the information provided to us by our members and guests to be accurate and current. It is beneficial for you to ensure your details are up to date to ensure we are communicating to you in your preferred manner and with the right messages you want to receive. You have the right to request access to what personal information we hold for you. You will need to contact the Panthers Group Privacy Officer or visit your home club to complete a Request for Access Form. You will need to provide photo ID before any information can be released. 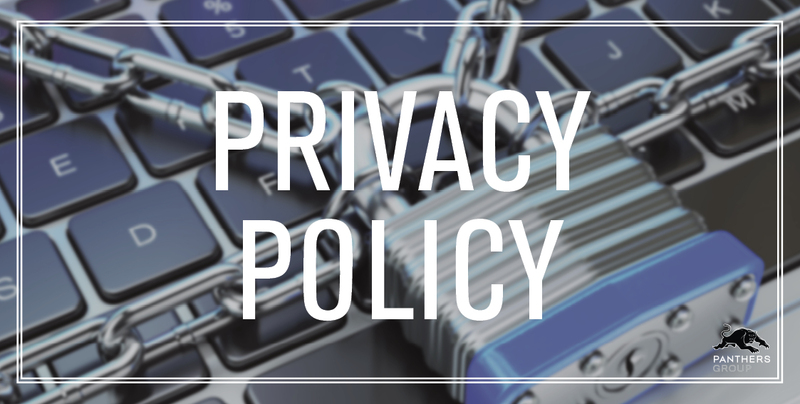 There are exceptions under the Privacy Act where we may have to deny you access to your information. Personal information on our members and guests is stored and archived in controlled environments for a period of seven (7) years. Employees of the Panthers Group are bound by confidentiality agreements to protect your privacy. We have security measures in place to ensure any personal information shared with us via our websites is protected and secure. When you visit our websites our internet supplier will make a record of your visit and log some information for statistical purposes only. The information logged may consist of your computer address, your domain name, date and time of your visit and pages visited within our site. We will only record your email address if you send us a message or submit an online form. All of the clubs within the Panthers Group have and use surveillance systems. It is important to note that when visiting our venues you will be recorded on our surveillance system. We may use these recordings to review or assist if an incident occurs on our premises. We do not disclose our surveillance records unless we are required by law or to investigate illegal or undesirable activities within our club. If you are concerned by the manner in which your Personal information has been collected or used you can lodge a complaint with the Panthers Group Privacy Officer. All complaints will be reviewed, assessed and responded to within 21 days. Where necessary we will take the required actions or corrective measures to resolve. Panthers Group venues practice the responsible service of alcohol. © Copyright Panthers Group 2019.